Obituaries for victims of the Humboldt Broncos crash have appeared on a website that aggregates death notices from across Canada, while adding offers to purchase gifts and memorials, without the involvement or permission of the families. The site also has connections to Afterlife, another obituary site which shut down earlier this year amid criticism. 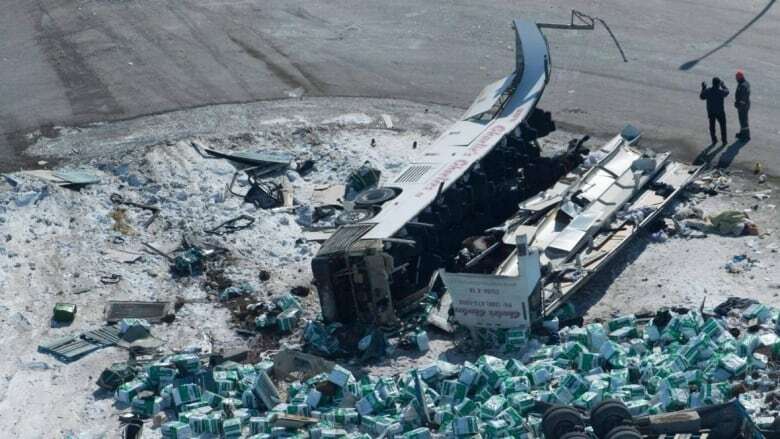 Everhere posted obituaries for 12 of the 16 people who were killed on April 6 in the Broncos bus crash between Tisdale and Nipawin, Sask. Funeral officials and family members tell CBC News the obituaries were listed without their permission. Many of them are also inaccurate, with an incorrect place of death noted for most of the victims. Everhere calls itself a "database of obituaries that are found online" and runs advertisements alongside them. The site charges $4.99 to remove the ads. It also provides links to purchase flowers and to light digital memorial candles, which sell from $5.99 up to $29.99. 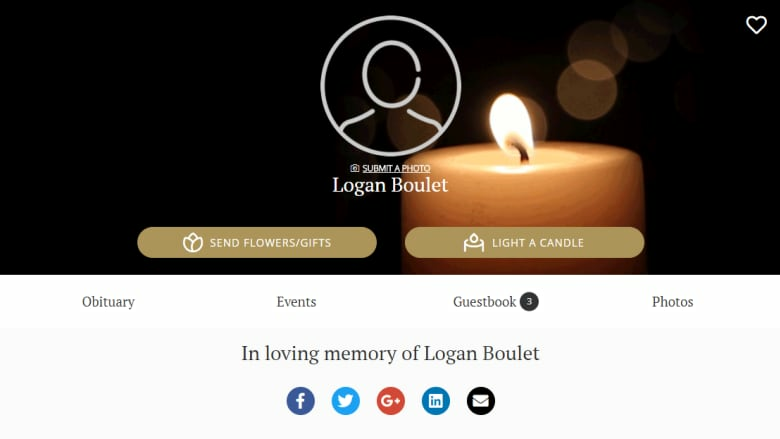 As of Saturday evening, two people appeared to have purchased digital memorial candles on Everhere in honour of Broncos defenceman Logan Boulet. Chris Jong, general manager for Martin Brothers Funeral Chapel in Lethbridge, Alta. — which provided funeral services for Boulet — said he's never heard of Everhere and the obituary provided on the website was not authorized by the family. "I'm fourth generation funeral director. I've been 15 years in funeral service just myself. I've never seen anything like this before," said Jong. Jong said he doesn't have any idea where money spent on Boulet's Everhere obituary may have gone, because it did not go to the family's chosen funeral provider. Bonnie Schatz, mother of crash victim Logan Schatz, said her family did not place an obituary with Everhere. "Unbelievable that people would do something like that," she said. Everhere listed Logan's place of death as Martensville, Sask., a community some 200 kilometres from the crash site. That obituary has since disappeared from the site. It is not clear if any families of the crash victims dealt with Everhere. Everhere CEO Pascal (Paco) Leclerc declined to be interviewed by CBC News. But, in an exchange of emails, said the obituaries posted on the site without the involvement of families use only "basic facts of the deceased." He said the company's mission is to connect society with grieving families, and that family members can ask for obituaries to be removed. Schatz said the site "obviously … took it from the original," referring to the obituary placed in the Saskatoon StarPhoenix and on the Saskatoon Funeral Home's website. The funeral home provided the obituary, as written by the family, to the newspaper but not to Everhere.com, according to funeral director Morgan Edwards. Funeral home websites are provided as a service, said Edwards, and don't sell "condolence items." "It's basically a hub for the family to go to and refer friends to share memories and share stories," he said. Edwards said sites like Everhere should not divert people from more traditional obituary providers. "It's taking away from the hub of where this information should be collected … rather than a standalone site that really is only in it for money," he said. "It could lead to a situation where families are feeling taken advantage of by for-profit websites." The site bears a resemblance — and has some of the same staff, including Leclerc — to Afterlife, a site which closed down in January amid criticism it was running obituaries, without permission, in an attempt to sell merchandise. Visitors to that site, Afterlife.co, are automatically redirected to Everhere.com. Jordon Le Brun, formerly of Afterlife, also works at Everhere. It is not clear who owns either domain because, according to internet records, they were registered through anonymizing services. 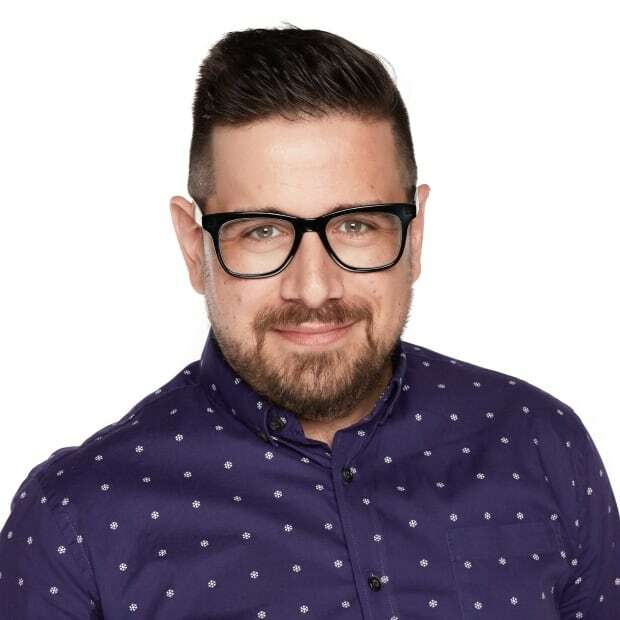 The federal government's corporate registry continues to list Afterlife Network Inc., or Réseau Après La Vie Inc., as an active corporation based in Quebec City, with Leclerc listed as the only director. There are no entries for Everhere in the federal or Quebec registries. Leclerc denies the two websites are related. "Everhere is not the successor [to Afterlife.co]. It's an entirely new company and business model," Leclerc wrote in an email. One critic of Afterlife is disappointed a similar site has appeared. "It kind of feels like we failed," said Amy Lavier, the Pembroke, Ont., woman who criticized Afterlife after it published her four-year-old son's obituary without her permission. "To see it's happening again, it's just not right what they're doing," she said. According to the Everhere site, if flowers are purchased on their site the order is passed on to local florists. However, the site also includes information on an "affiliate program" that encourages people to add obituaries themselves. The program offers participants "10 per cent from flowers and 50 per cent from candles purchased through your shared obituaries." Leclerc said that money is allocated to funeral homes and newspapers. "Through our Affiliate Program, funeral homes and newspapers receive shared revenues that can go towards helping families in need with their funeral costs," he wrote. He said funding from the digital candles go toward operational costs.